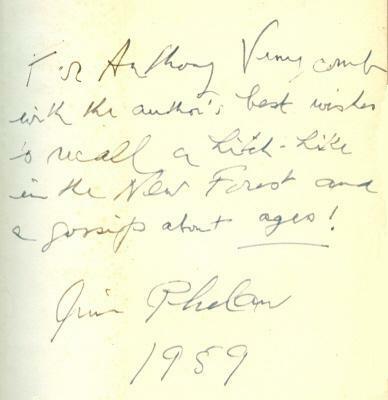 Below is an abridgement of an episode related on pages 123-130 of Criminals in Real Life (London, 1956), whose dust-jacket describes Phelan as ‘blacksmith, journalist, ship’s fireman, film script writer, barman, broadcaster, navvy, actor, gun-runner, convict and tramp’. He made me a very useful telescope, for six inches of pigtail tobacco, and he gave me a kaleidoscope “for nothing”, only coming to borrow three inches of pigtail a few days later. Then one day he sent me over a chess-piece, a white queen, carved from bone. It was a lovely piece, and I told Billy so when I asked him the price. He glowed at the praise, said the price didn’t matter for the moment. Then I asked him how long the piece had taken him to carve. “Six months you’d give me, eh?”, he inquired. Knowing the difficulties under which he worked, I nodded agreement. Then, since there are 32 pieces in a chess-set, and since all jail-humour is pretty grim, I made the correct wisecrack. “In that case, Brummy”, I grinned, “all you need is three or four more laggings, and you’ll have the full set.” Brummy seemed to have been waiting for me to say something like that. 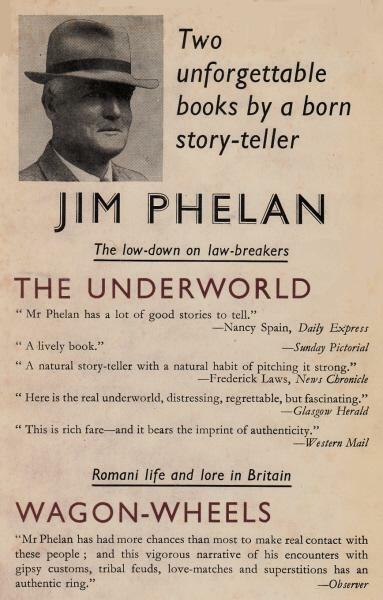 .The offer was refused, Phelan being requested instead to make him a key in the prison workshop. The exchange was made a few days later. 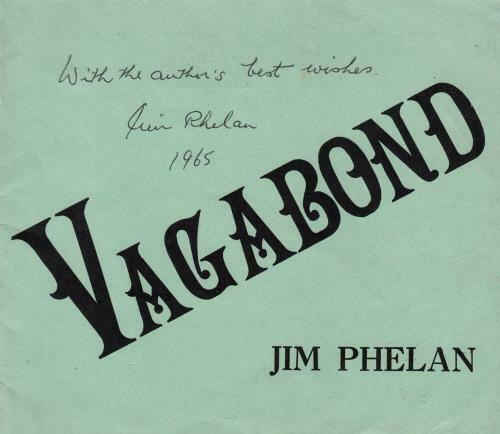 Our collection contains several books inscribed by Phelan, including Criminals in Real Life (above). 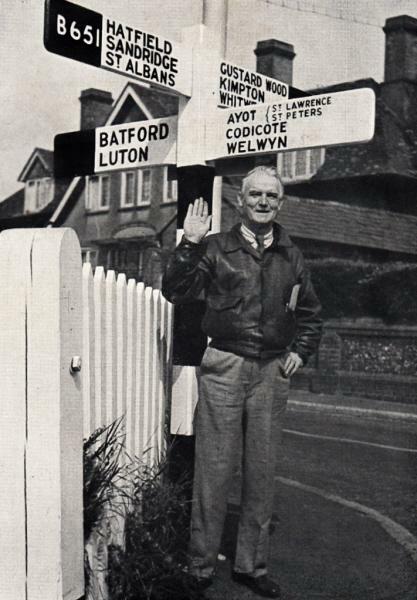 The dust-jacket of our copy also features his handwritten ‘address’: ‘The Post Office, Burley, Ringwood’. 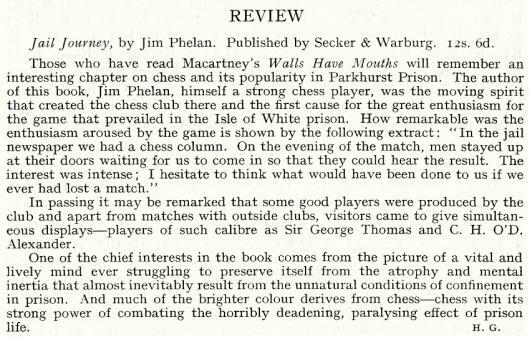 It is on pages 201-207 that the chess club at Parkhurst Prison is mentioned in an excerpt from the book Walls Have Mouths by Wilfred Macartney (London, 1936). 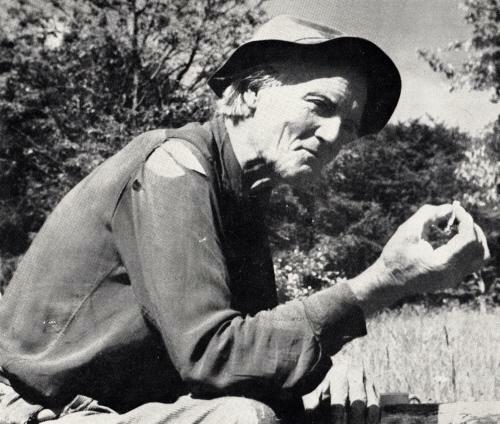 The autobiography’s dedication page comprised two words: ‘For myself’. As will be seen below, the lengthy game was against Phelan. As noted above, the book was entitled Walls Have Mouths. 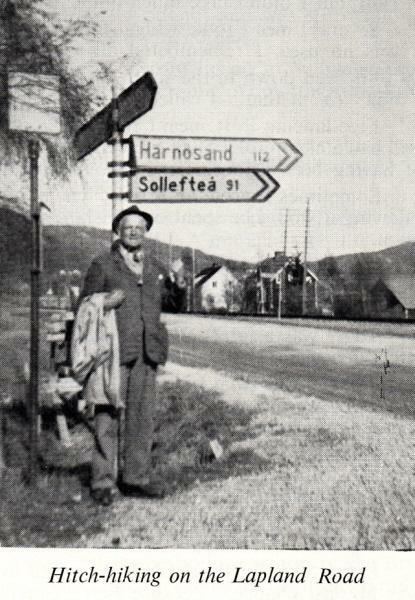 ‘I still went to the Chess Club on Saturdays, but I was not the Club champion now, not least for a time. Only once, for a week or so, I recaptured some of the old fierce energy, when Sir George Thomas came down to play against us. Thomas was in the champion class, has held the British Championship, would never insult a player by giving him the slightest chance or patronizing him in any way. To play against Thomas was going to be an intellectual and emotional treat for most of us. Not least for me. After all, the Club was my baby, born after years and not months of travail in the strangest home in the world. Thomas going to be a fine god-parent. It is laughable now, but I was furious at the time; things nearly went wrong. There was no need to school my players. 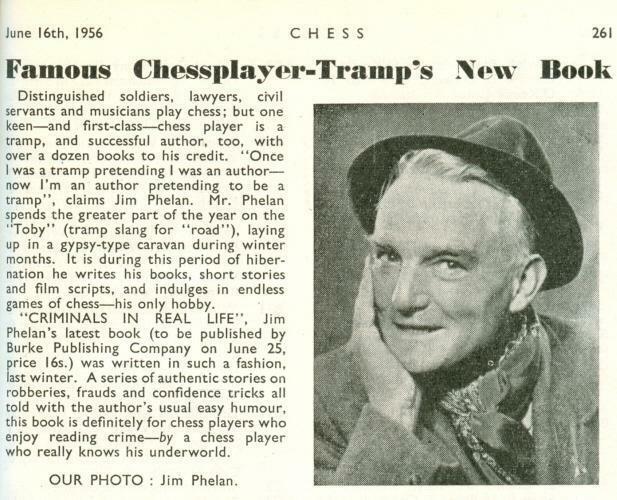 They knew chess etiquette, and grave punctilio, as well as any men in Europe. They would not let the jail team down. Yet Thomas was nearly embarrassed after all. 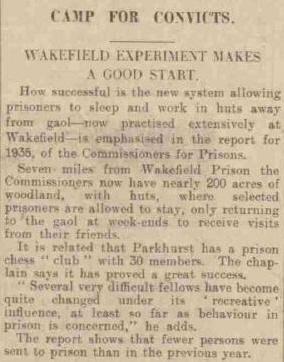 It will have been guessed that not every jail-employee saw eye-to-eye with Clayton about “letting people play chess”. In the early days of the Club there had been many ludicrous clashes with groove-minded officials who could not understand that times had changed, that it was no longer “days gone by”. (“Lee don f’r chess. ’Alt. C’mmence chess.” As if arrogant people like Macartney or myself – with official backing – could tolerate that kind of nonsense.) Lately things had been moving more smoothly; no-one tried to be obstructive; Scott had continued, and backed, the Chess Club, exactly as Clayton had done. Thomas came. He played all of us. Time passed. The session was longer by far than most similar plays “outside”; we were rather tough nuts to crack. The hour for finishing had gone by. We ought to be in our cells. We played on. At the first board, I was organizer, secretary, semi-grass watcher that everything went well, buffer between Thomas and intruding screws, and I was also playing Sir George. Our game had gone 70 moves. I was going to draw. I knew I was going to draw. Now this was something to be conceited about. I did not wish to kill the man, did not even, I insist, desire to kick him again and again in the mouth! Such is the superhuman self-control of the skilled chess-thinker. I advanced from my place, hoping Thomas would not have understood. The boys were looking at me anxiously. On the command, they should have filed silently outside, leaving Thomas in an empty room with some useless chess-men. No-one moved. Blakely from Ryde was there, a civilian chessplayer who had a semi-official status. Blakely backed me up, and we wafted the zealot outside, stilling his murmurs that it was “past time now. Bell’s gone”. He wasn’t even in charge either! Just a zealous exponent of the code, demonstrating that courtesy, decency, sensitiveness or consideration for the feelings of others cannot possibly exist in an illiterate degraded convict! Or something like that. Presently the man in charge appeared, a little later the Chief showed up, and all was quiet again. I went back to my board, made my move, lost my game. Curse that groove-brained code-mumbler! An extract (‘Chess in Parkhurst’) from Walls Have Mouths by W. Macartney also appears on pages 25-27 of The Chess Player’s Bedside Book by R. Bott and S. Morrison (London, 1966).